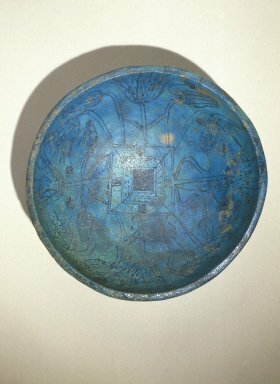 Large blue faience bowl. Interior elaborately decorated with painted square pond in center from which grow lotus buds and flowers. Exterior, decorated with single large lotus calyx. Condition: Intact. Very minor chips on rim. Glaze worn in spots on interior. Some ancient incrustation on interior. Glaze and decorations very worn on exterior. Good workmanship.